I just created a new WordPress site, and could not change the size of the logo, so decided to delete it and try uploading a new image. This created a new problem in that the site title now appears twice. I have tried deleting it in Settings>General and re-typing it, but that does not fix it. I have also looked at the code in Appearance>Editor>Header.php, but cannot see where the title is in that file. Also, removing the logo has also caused my favicon to disappear from the title bar. Any assistance that can be offered would be most appreciated! Seems like you’re already using another theme. Can’t help you without seeing the issue. Where the title was appearing twice? On the header image or in your browser’s title bar? It’s in the header image. Still using different theme, not Graphene. But the fact that this is showing up with a different theme indicates that this is not a theme issue. 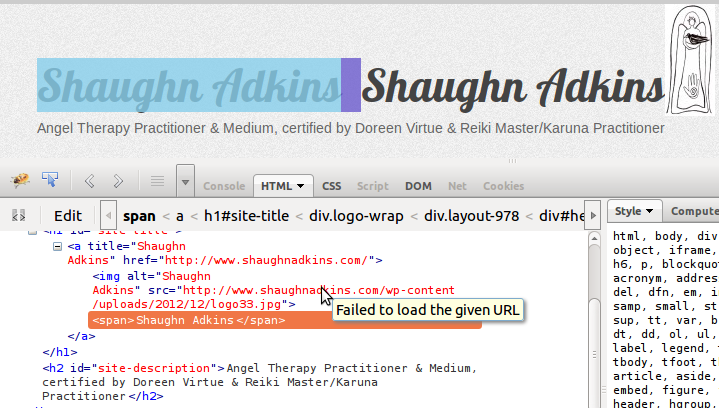 The problem is that you are using a header image which is returning a 404 (http://www.shaughnadkins.com/wp-content/uploads/2012/12/logo33.jpg), so it is displaying both the ALT for that image along with your header title. How can get the header image to stop displaying the 404 error? This problem started when I accidentally deleted the logo back on the left side of the header, so can tell me how to put the logo back? Many thanks in advance. I have put the logo back in, but I would like it to be on the other side of the title. Also, still need to delete the duplicate title name. A few posts back, Ken Odle said my header image (logo33) is returning a 404. I can’t find either logo 33 or the alt tag in the file. Where are you seeing it? ..Ken Odle said my header image (logo33) is returning a 404. I can’t find either logo 33 or the alt tag in the file. Where are you seeing it?